"A whole-wheat and almond butter version of the Chinese cookie classic. These treats are an ideal partner-in-cookie-crime to a cold glass of milk or a cup of afternoon tea." Preheat the oven to 375 degrees. Spray two baking sheets with cooking spray. In a large bowl whisk together the flours, salt and baking soda. In another large bowl beat together the butter, almond butter and sugars until fluffy. Add the vanilla and egg and beat until well combined. Gradually stir in the flour mixture, blending well. Shape the dough into 3/4 inch balls, and place on the baking sheets. 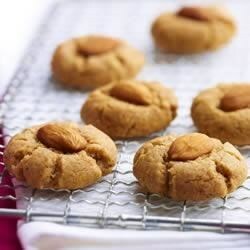 Place an almond in center of each cookie and press down lightly. Bake for 10-12 minutes, until lightly browned. Cool on a wire rack. Easy and elegant, these almond appetizers are anything but complicated. A nice alternative to peanut butter cookies. My daughter has a peanut allergy and this was a tasty swap for the whole family to enjoy. DH really liked them. I prefer a traditional PB cookie. I omitted whole almonds and added 1 cup chocolate chips. These were very bland. Will not make again.